Click these thumbnails for enlarged views of the Dual Memory proposal. This designs creates a space on the spot of each of the twin towers; one representing each individual victim and the other representing the collective loss of September 11. 2,982 lights illuminate a covered area on the spot of the North Tower. 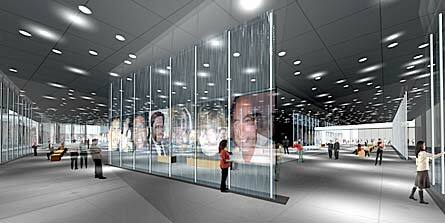 Water flows down glass walls with images of the victims. A burial site for the unidentified victims is located at the bedrock level serves as a private area for the families of the victims. The other memorial contains 92 sugar maple trees, symbolizing the 92 countries from which the victims of 9/11 came. A path descends downward through this area, with its lowest point at the center. Both Brian Strawn, from rural Illinois, and Karla Sierralta, from Venezuela, work at architecture firms in Chicago. The memory of an individual and the combined memory of the community as a whole are embodied by the footprints of the former World Trade Center Towers and the new future for the area. On a personal level, and as members of our larger communities, we were all affected by the terrorist attacks on February 26, 1993 and September 11, 2001. The footprints serve as healing points for our great losses. Elements of water reflect light and memory. 2,982 light portals shine over the "Individual Memory Footprint", where the North Tower of the WTC once stood. Each light glows with individual intensity, honoring all of the victims who died. Elements of water embrace and reflect memories related to those we lost, those who survived and the selfless actions of those who aided in rescue, recovery and healing. The journey to the emotional center of the footprint is a personal experience. Evolving images are reflected as water flows down the walls that support the plane of water above. On glass and stone, the names are revealed. Here, as stories are shared, they become part of our collective. A final resting place for the unidentified remains embraces a private area for family members and loved ones. This space, at bedrock, becomes the most sacred. Elements of earth create spaces that frame the sky. 92 Sugar Maples trees stand on the "Shared Memory Footprint". The space, where the South Tower of the WTC once stood, is devoted to the shared loss of a community, a city, a country, and the world. These native trees of New York grow as a symbol of new life in the soil of each of the 92 nations brought together by the great tragedies. A shared path guides visitors through bands of nature that form around the emotional center of the footprint. Stone walls that carry messages of hope from each of the countries and a bed of wild roses surround this quiet space for meditation and contemplation. The emotional centers of each of the footprints resonate at a different pace. The constantly evolving stories of the individual inform the more slowly developing shared perspective of the collective. These encounter one another, exchange their composition, and form landscaped patterns allowing for intimate and public gatherings. Although the intensity of the lights changes during the course of day, and the trees weather with the passing of the seasons, the footprints will act as a constant reminder.